There once was a turkey named Larry who lived in a small wood next to a hunting shack. The shack was owned by a very bad hunter named Earl. For ten years Earl had been trying to shoot Larry to eat him for Thanksgiving dinner. Instead, for the last ten Thanksgivings, Earl ate General Tso’s chicken and beef dumplings from Mr. Sing’s House of Chinese Delicacies and Non-Denominational Wedding Chapel. Also two years ago he married 3rd shift waitress Darlene Lumpholz in a ceremony presided over by Mr. Sing and witnessed by long haul trucker Darryl “Dirty Deeds” Hufnagel. They were divorced 6 days later. Larry the turkey was worried this year. He was getting older and although he was smarter than Earl, Larry was afraid he would get caught. He had decided that it was time to make peace with his nemesis. He went to Earl’s door and was invited in where the two combatants shared in a feast of Frosted Mini-Wheats while Earl relayed the dream he had had the night before where he won the lottery, ran off with Katie Couric and then drove in the 24 hours of Lemans in a soap box derby car. They spent hours discussing their differences like how much Earl wanted to eat Larry and how much Larry really did not want to be eaten. What they found in the end is that they were very much alike. They commiserated over stories of their domineering fathers. Earl’s wanted him to go into the family business of lard production while Larry’s repeatedly told him he was a bad gobbler and wouldn’t live past 6 months in the forest on his own. After a few ribald jokes and shots of . . . wait for it . 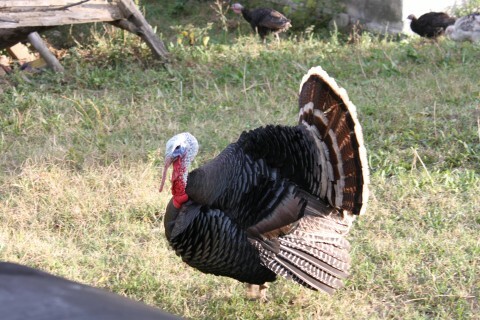 . . Wild Turkey, Earl and Larry were friends. As offerings that signified their new trust, Larry gave Earl one of his tail feathers and Earl gave Larry his Dale Earnhardt commemorative flashlight. Brimming with renewed hope and confidence Earl reconnected with Darlene at the Thanksgiving evening buffet at Mr. Sing’s and they were re-married with Darryl “Dirty Deeds” Hufnagel once again looking on and toasting them with a tall boy of Schlitz. Herman Cain is the latest of the Republican presidential nominees to distance himself from the pack, in a bad way. At least 3 women from his past have accused him of sexual harassment and while he was rope-a-doping his way around that problem, he gave an interview where he was asked his opinion about a pretty big news event of the past few weeks and he drew a blank. So I decided to imagine what it would be like to interview Mr. Cain. CO: So, Herman, what the hell is up with you? HC: I’m bloviatin’ as fast as I can. CO: Uh huh. What I mean is: What is wrong with you? HC: I guess its time I came clean. I used to snort pepperonis while running Godfather’s Pizza. That’s my dirty little secret. CO: What do you think of Libya? HC: Ah ha! A gotcha question! I’m ready for ya’. Libya is a country in northern Africa with a population of 5.6 million. Its main export is oil and its leader is Muammar Gaddafi. CO: Gaddafi is gone. Dead. Rebels overthrew his oppressive regime after 40 years. Any of this ringing a bell? HC: Right! Libya. Right . . . I just have so many pizza recipes twirling around in my head . . . let’s see Libya . . .
HC: No! I want to answer. The truth is I’m not sure about the details of the Libyan coup, but whatever role Barack Obama played, it was wrong. He handled it wrong with a capital W.
CO: What exactly did he do wrong? HC: Right . . . well, he didn’t do what I would have done . . . in the first place. HC: First of all . . . the bombs . . . that . . . and secondly . . . Obama is just wrong . . . he did something, and I don’t agree . . . things would be different . . . if . . . no, that’s . . . Obama was wrong. End of story. HC: I do that to people. It’s my charisma. CO: Is that another word for aneurysm because I think you’re giving me one. CO: Why do you sexually harass women Herman? HC: Loves me some women! Wait, I mean . . . women are . . . women have . . . You know I have a tax plan based on the number 9. Did you now that? Could we . . . talk about that . . . maybe . . .
CO: I’d rather talk about the harassment claims. HC: Falsified! Falsified claims made by gold diggers who want Herman Cain’s pizza money! Money that I will get to keep more of under my 9-9-9 tax plan. CO: The one that you stole from a video game? HC: Yes! No! I came up with that myself one night on the campaign trail. I do not play video games! 9-9-9! Libya! Gold diggers! Obama’s wrong! Thank you! CO: Thank you Herman. I need a sedative. I have a cell phone mainly for emergency purposes. I don’t text, I don’t tweet, I don’t watch Israeli action movies on it, I don’t take pictures of every single thing I see and post it on Tumblr, I can’t land a Harrier jet on an aircraft carrier, I can’t control the route of a city bus, I can’t read John Grisham’s latest tome of good lawyer vs. bad lawyer. I carry the phone with me and occasionally make a call. To save money I have a Tracphone. There is no $80/a month plan with so many conditions and provisions you need a major in accounting with a minor in international law to understand the contract you are signing in blood. To keep a Tracphone active you add a minimum of 20 minutes to the phone every 3 months at a cost of $20. If you miss your end date, however, then you have to call the company, talk to a man with a Pakistani accent named Steve and jump through hoops to get it reactivated. I believe the last time I had to purchase an elephant and teach it to use its trunk to blow “Melancholy Baby” on a trumpet before my service was restored. Last Friday was my last day to get a new card to put minutes on before my phone deactivated. I went first to a local grocery store I knew sold the cards. The store was packed with what appeared to be lunatics from an asylum, wandering the aisles, gape-mouthed and drooling. I bobbed and weaved through the throng, got to the Tracphone display stand only to see the $20 cards sold out. Oh, they had plenty of the expensive cards: 200 minutes, a years worth of minutes, enough minutes to connect with the other side and call your dearly departed Aunt Gertrude to ask why Uncle Fred can’t stop farting when he walks. If I had wanted to take out a loan from the man named Murray who sat behind a desk snacking on oyster crackers, I could have had my card. Instead I got back in my car, fought the traffic to drive through the intersection to the Rite Aid on the other side of route 24. I wandered the empty aisles until I found the display and . . . they were sold out of the $20 cards also. “What’s going on here?” I thought. Have I stumbled onto a vast, global conspiracy to deplete the stock of Tracphone cards? Were their men in black suits watching me, recording my thoughts and catching my skin flakes in tightly wrapped tin foil? Were the Lizard People using Soviet manufactured satellites to track the bar code imprinted on a computer chip that was embedded in my left nostril? I decided it was all a coincidence and left the store in a huff, giving an odd glance to a man in a dark suit perusing a copy of Global Conspiracy Magazine. I drove to yet another grocery store where finally, I found my $20 phone card. I should have ended my painful shopping trip right there but no, I made the fateful decision to buy a few groceries. It was during my time in the bread, egg and cheese aisle that I heard the thing that haunted the rest of my weekend. I was happily picking out a package of provolone cheese when a family passed behind me. It was a Norman Rockwellian scene: A mother with her three children in tow, shopping for the family’s basic needs. One of the children asked if they could buy a particular item. I couldn’t understand what the child said but the mother’s response flattened me. I have never vomited in a grocery store and I was determined to keep that streak alive. The bile that rose in my throat from the graphic image that popped into my head with a devious grin, stayed in my mouth. I choked on it. Choked hard. I ran to the check-out, barreling over an old woman trying to choose between extra-absorbent and super extra-absorbent paper towels. I showed the clerk the items in my hands, threw a wad of money at her and ran from the store. Once in my car, I wept openly. The world was a darker, danker place and my innocence had been tossed into the trash. I hate shopping on a Friday night.